Before TV captured the nation's attention, radio was the most popular form of home entertainment. Nowadays that box offers mostly music, news, and backtalk, but from the 1920s through the '40s, the airwaves boasted drama, comedy, and murder mysteries. Judson Fountain (b. 1952) grew up after the heyday of classic radio theater, but as a child heard vestiges of programs that had enthralled his parents. He developed an obsession with suspense-filled shows like The Shadow, Inner Sanctum, and Lights Out! While most Americans were evolving into couch potatoes, Judson embraced radio as the superior theatrical medium, and felt compelled to single-handedly revive the art. That he lacked training, technology, skilled staff and a budget did not deter him. Ed Wood, Jr. made movies; Judson produced radio dramas. Judson was between 17 and 22 when he produced these extremely primitive affairs. His simple, derivative plotlines employ Halloween kitsch -- spooks, witches, haunted houses -- as vehicles in morality plays about redemption for the honorable and damnation for evil-doers. The original recordings were pressed on LPs (reportedly about 200 copies of each). The jackets were hand-made, with grainy xeroxes pasted on otherwise blank cardboard sleeves. 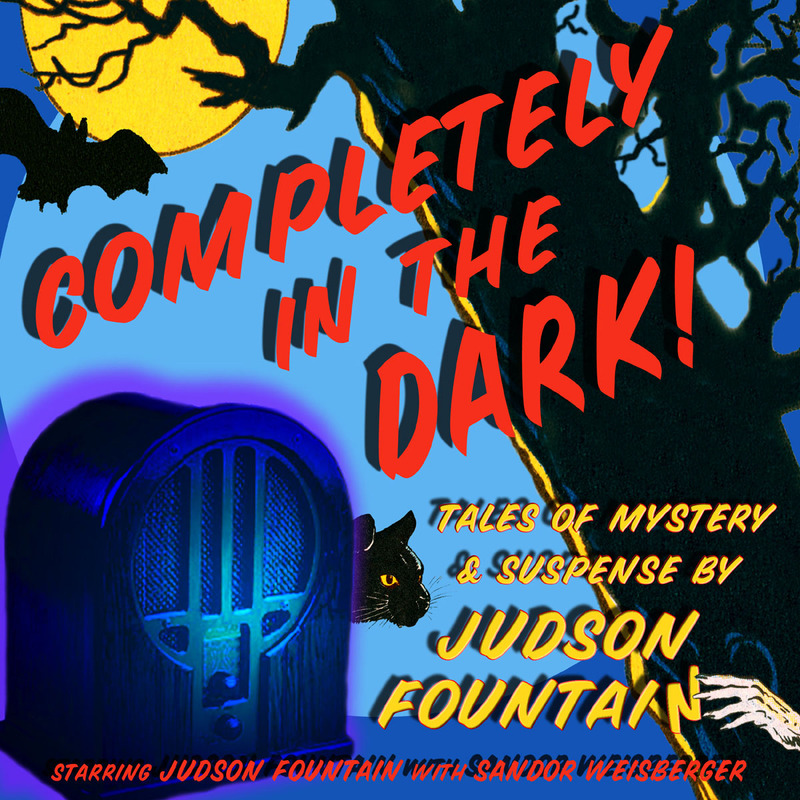 Innova Records is proud to present the first-ever collection of Judson Fountain radio dramas on CD. And, like Judson's originals, this will be a limited edition release, as part of Innova's heralded "Short-Run" series. Judson's work was characterized by cliché scripting, egregious ethnic accents, and inept editing -- all seasoned with copious needle-drops of creaking doors and howling wolves from the timeless Elektra Sound Effects Library. But this extreme amateurishness and unwavering sincerity synergize to great advantage in Fountain's theatricals. There is charm in the clumsiness, and befuddled amusement in the often-abrupt plot twists. Over the past decade, Judson's recordings have circulated among collectors of the bizarre, and in the process have attracted a cult following (especially, it seems, among cartoonists). His LPs have long delighted and bedeviled listeners of free-form radio funhouse WFMU. Jackson Brian Griffith, former Pulse Senior Editor, once summed up Judson's work: "Imagine paint-sniffers aiming for the Firesign Theatre and hitting Plan 9 From Outer Space." This is not an album for everyone. Nonetheless, we are confident that Judson's artifacts will attract fans. These echoes of a bygone art have an off-kilter perspective that in many ways is more entertaining than any note-perfect, professional replica of the original form. I hate this guy and his work. Wow. These utterly retarded (yet compelling) homemade spooky radio "drammers" were apparently actually aired by regional east coast stations in the late sixties and early seventies. While the experience of stumbling onto such lunacy on the airwaves can‚t be approximated by finding it compiled on CD, this screwball vision is a delight in any context. Every tale on the comp is a reductive morality play scripted around young Fountain's specialty voices˜an incredibly irritating old woman/witch, a mush-mouthed and seemingly senile gang boss, a tough-as-nails gun moll obsessed with her own name, and old guys with varying (horrible) Irish and Scotch accents. The simplistic, repetitive plotting, recurring snatches of dialogue, casual xenophobia and broad exposition have a weirdly rhythmic quality that will infect your brain and leave you thinking like Fountain. "No one blows the whistle on Pop Serriano!" Brilliantly out-there outsider radio-dramas from 1969-74 —not for everybody, but I dig it!